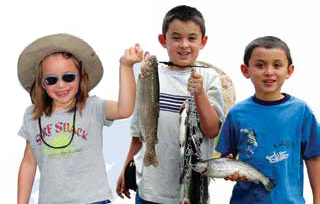 Family fishing opportunities, including Fishing in Las Cruces, are found across the state of New Mexico. 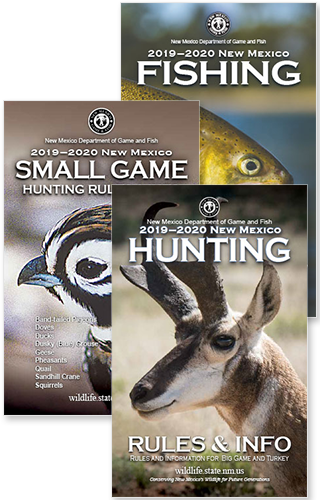 This list is available in PDF format Convenient Family Fishing Locations, the latest New Mexico Fishing Rules and Info booklet, or search and sort the online table below. For additional information planning your trip, see Regulations for Specific Waters as well as Disability, Age, and Military Benefits. Albuquerque Albuquerque Area Drains Rainbow trout, catfish, bass. Albuquerque Tingley Beach - City of Albuquerque Bio Park Winter rainbow trout; Summer catfish. Carlsbad Carlsbad Municipal Lake and Bataan Lake The Pecos River is dammed in town creating two city lakes. Rainbow trout, largemouth bass, bluegill and catfish. Clayton and Springer areas Clayton Lake Rainbow trout, walleye, bluegill, catfish, largemouth bass. Clayton and Springer areas Springer Lake Northern pike and channel catfish. Clovis Green Acres Pond and Ned Houk Ponds Winter rainbow trout and summer catfish. Farmington and Bloomfield areas Navajo Lake Kokanee salmon, smallmouth bass, crappie, rainbow trout, bluegill, channel catfish. Farmington and Bloomfield areas San Juan River World-renowned tail-water trophy rainbow and brown trout. Grants Bluewater Lake Trophy tiger muskie. Grants Grants Riverwalk Pond Rainbow trout and summer catfish. Now open to all anglers. Hobbs Green Meadows Pond Bluegill, summer catfish and winter rainbow trout. Jemez Springs Seven Springs Fish Hatchery Brood Pond Rainbow trout, brown trout; youth 11 years of age and younger. Las Cruces Caballo Lake State Park Walleye, blue and channel catfish, white bass and crappie. Las Cruces Elephant Butte Lake State Park Blue catfish, white-bass, largemouth bass, smallmouth bass, crappie, walleye. Las Cruces Young Pond Winter trout and summer catfish. Moriarity Corona Pond Winter rainbow trout and summer catfish. Moriarity Estancia Park Ponds Rainbow trout. Portales Oasis Lake Winter rainbow trout, summer catfish and bluegill. Raton Lake Maloya Rainbow trout. Roswell Lake Van Community Lake Winter rainbow trout and summer catfish. Ruidoso Alto Lake Winter trout and summer channel catfish. Ruidoso Grindstone Reservoir Rainbow trout, smallmouth bass and catfish. Ruidoso Ruidoso River (Sacramento Mountains) Rainbow trout. Santa Fe area Monastery Lake (near Pecos) Rainbow trout. Santa Fe area Abiquiu Lake Rainbow trout, smallmouth bass, crappie, walleye, kokanee salmon. Santa Fe area Cowles Pond (Pecos River, north of Pecos) Rainbow trout. Youth and individuals with disabilities (Handicapped Fishing License) only on the smaller upper pond. Santa Fe area Santa Cruz Lake Rainbow trout. No-wake boats only. Anglers with a canoe can get onto the lake for bluegill fishing in the summer months. Santa Fe area Upper Pecos River Brown trout and rainbow trout. Santa Rosa Conchas Lake Walleye, channel catfish, white bass and smallmouth bass. Santa Rosa Santa Rosa Lake Walleye, crappie, bass and catfish. Santa Rosa Santa Rosa Pond at Blue Hole Park Winter rainbow trout and summer catfish. Youth, senior and individuals with disabilities (Handicapped Fishing License) only. Green sunfish, bluegill, channel catfish and largemouth bass. Santa Rosa Ute Lake Walleye, channel catfish, white bass, smallmouth bass. Silver City area Bear Canyon Reservoir Largemouth bass, rainbow trout and catfish. Silver City area Bill Evans Lake Largemouth bass, rainbow trout and catfish. Silver City area Gila River Trout, smallmouth bass and catfish. Silver City area Lake Roberts Largemouth bass, rainbow trout and catfish. Silver City area Quemado Lake Rainbow trout and tiger muskie. Taos Eagle Nest Lake Rainbow trout, kokanee salmon and yellow perch. Taos Heron Lake Kokanee salmon, rainbow trout, lake trout. Taos Red River Hatchery Pond Rainbow trout. Youth, senior and individuals with disabilities (Handicapped Fishing License) only. Taos Rio Grande Brown trout, rainbow trout, northern pike, smallmouth bass, Rio Grande cutthroat trout.